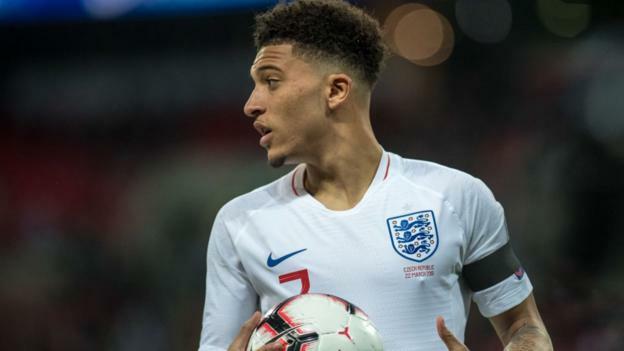 England’s young players need to be prepared for a “hostile environment” when they take on Montenegro in their Euro 2020 qualifier in Podgorica on Monday, says manager Gareth Southgate. When England played in the city in 2013, players were verbally abused and targeted with missiles. “That is the sort of challenge our players have faced many times before,” Southgate said. England beat the Czech Republic 5-0 in their opening Euro qualifier on Friday. “I know the passion the supporters have for their country and of course that gives a huge lift to their own team,” Southgate added. “We have to make sure our discipline is right and we focus on what we can affect. Southgate fielded a young team against the Czech Republic – handing a first competitive start to 18-year-old Jadon Sancho and debuts to Callum Hudson-Odoi, also 18, and Declan Rice, 20. But they were impressive in their opener and top Group A after Montenegro drew 1-1 against Bulgaria. Asked whether he would consider putting out a more experienced side in the circumstances, Southgate said: “I have no hesitation in playing them [the young players]. This is part of their education and to be a top team we have got to adapt to every environment we go into. “Playing at Wembley is always going to be a different sort of experience to going away from home but the only way they can learn and improve is to go through these experiences. Manchester City winger Raheem Sterling scored a hat-trick in the 5-0 win over the Czechs on Friday and Southgate later revealed the 24-year-old had been added to a strong ‘leadership group’ within the England squad, set up by the manager before the World Cup last summer. “When we started working with the team, I felt there was a lot of burden on one captain and you need other people to take the lead in different moments,” Southgate told BBC Radio 5 Live. “Raheem’s development as a person over the last year or so made him an absolute ideal person to come into that group. He is behind Jordan Henderson as our most capped player, so it’s a no brainer really to involve him. Southgate said Sterling “definitely has the attributes” to captain England one day and could follow in the footsteps of Eric Dier, Fabian Delph, Henderson and Harry Kane. Southgate could name a similar starting line-up against Montenegro but will be without midfielder Dier after he picked up a muscle injury 13 minutes into Friday’s win. He was replaced by Ross Barkley, who could be given a start in Montenegro – although Friday’s debutant Rice is also an option. Southgate will also check on the fitness of Jordan Henderson, who has a minor ankle problem, and Sancho after he complained of some muscle tightness after excelling in that 5-0 win. If fit to start, Liverpool midfielder Henderson would be making his 50th appearance for England. Southgate said it would be a “great honour” for Henderson to pick up his 50th cap because he joins a group of only 59 players to have achieved the feat. England have won one and drawn three of their four previous matches against Montenegro in all competitions, running out 4-1 winners in their most recent encounter in October 2013 at Wembley. England have drawn each of their two previous away games in Montenegro (2-2 in October 2011 and 1-1 in March 2013), last drawing three away matches in a row against a single opponent back in August 2009 versus Netherlands. Montenegro have won just one of their past five matches (W1 D1 L3), drawing 1-1 in their first qualification game against Bulgaria. Stefan Mugosa has scored four goals in his past four internationals for Montenegro. The Three Lions have not lost any of their past 21 away competitive matches (W14 D7) since a 0-1 defeat in a 2010 World Cup qualifier against Ukraine in October 2009. England have won their three previous matches played on a Monday under Gareth Southgate, beating Slovakia, Tunisia and most recently Spain. Only in games played on a Sunday (4/4) does Southgate have a better 100%-win rate. They are looking to win five consecutive matches for the first time under Southgate – they last won five in a row in October 2015 under Roy Hodgson. Against the Czech Republic, England didn’t feature a Manchester United player in a competitive match for the first time since November 2007 against Croatia – they last failed to feature a United player in two consecutive competitive internationals in November 1990 (against Poland and the Republic of Ireland). Raheem Sterling has scored five goals in his past three England matches – he had scored just twice in his first 45 appearances; the Manchester City forward has scored with five of his past seven shots, having netted with just two of his first 62 shots for the Three Lions. If Sancho scores against Montenegro, he will become the youngest England player to score on his birthday (19), and the first since Steven Gerrard did so against Hungary in May 2006.